A quick run through of our Lodge shuttle services for the 2018-19 ski season, all guaranteed to make your stay with us more enjoyable. ARRIVAL PICK UPS AND DEPARTURE DROP OFFS – Guests, whether arriving at the Welcome Centre (bus transfer from the Airport or Sapporo City) or the Kutchan Railway Station (train from the Airport or Sapporo City) are picked up and taken to the Lodge. Just let us know how you will get here and the time and we’ll be sure to pick you up. If you’d like some help organising your arrival, let us know here at info@ramatniseko.com we’d be happy to help. FIRST TRACKS SHUTTLE – 8.00am every morning gets you to the lifts before they open at 8.30am, always a fun trip in the morning with everyone rearing to go. NIGHTLY DROP-OFFS into the Village at 6.30pm with a Pick Up from Seico Mark at 10pm, nightly. The shuttle leaves from Ramat Lodge only, just pop across from Snowgum Lodge and go to enjoy the food and night life of the village or relax in one of the amazing onsens on offer. SHOPPING TRIPS into Kutchan Town, a 15min drive from Hirafu, happens approx. 3 times a week. There’s a white board in Ramat Lodge where you can write your name down for the Nightly Drop Off and Shopping Trips. 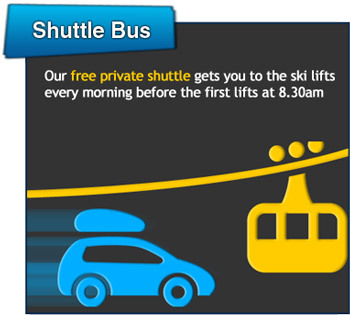 And remember the Free Grand Hirafu Shuttle operates between 8.30am – 8.30pm every day. Buses approx. every 20mins and there’s a bus stop less than 150m from the Lodges. Check them out here http://www.grand-hirafu.jp/winter/en/access/bus.html . If you have any inquiries while you are staying with us, the friendly staff will do their best to help where they can.